Right now the PC-3000 products are manufactured in Prague according to the highest standards of the European quality. 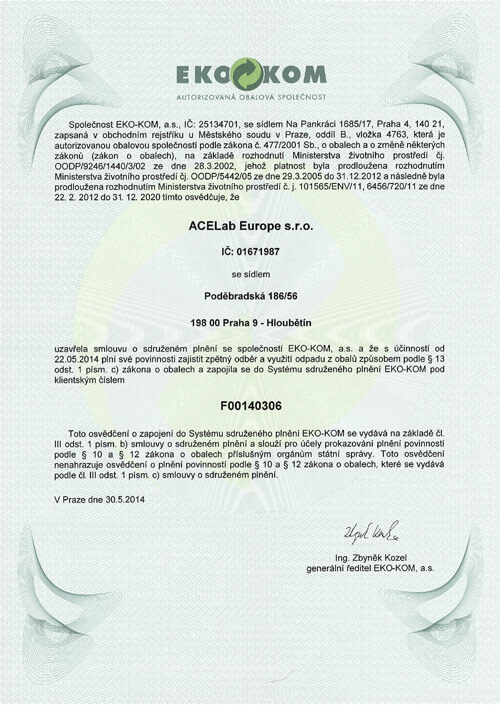 The PC-3000 products are officially certified for compliance with the European standards, which is proved by Electrical Safety Certificate for PC-3000. 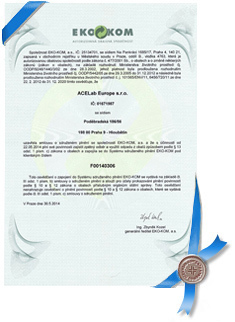 ACELab Europe also possesses the EKO-KOM certificate which is awarded to the companies that recycle packaging materials for re-use in manufacturing. It is much easier and faster to get the PC-3000 products from our Europe office: the payment methods are more convenient, we are organizing the payment by debit/credit cards, the goods are ready for shippment within 24 hours. Those customers who have purchased the PC-3000 tools recently have already noticed the big progress in the quality and speed of the purchase deals. Training in Prague will soon become available, and you will have better opportunities to get the high-end data recovery training according to ACE proprietary training programs in Prague. Being located in the center of Europe, our Prague office opens new wider perspectives for all our customers to get the best products and services much easier and faster. To get more information, please feel free to contact your personal sales assistant.